New York's Lower East Side has been the city's cultural center for many decades now. But when it comes to art movie theaters, you had to go across Manhattan to Film Forum or schlep all the way up to Lincoln Center to catch a Lav Diaz or Frederick Wiseman or Sammo Hung film. It is only fitting then it's about time that LES deserves its own repertory movie theater. Founded by designer Alexander Olch, Metrograph took over an old warehouse on 7 Ludlow Street. It's a state of the art movie theater playing mix of first-run independent & international films and old repertory films both on 35mm and DCP. Two renowned film curators in this part of the woods join the team-- Jacob Perlin, programmer-at-large at FSLC and associate programmer at BAM Cinematek and Aliza Ma from the Museum of the Moving Image and TIFF, to offer you a tantalizing progamming. On Friday, March 4, the curtain goes up on Metrograph, the first independent movie theater to open in Manhattan in more than a decade. 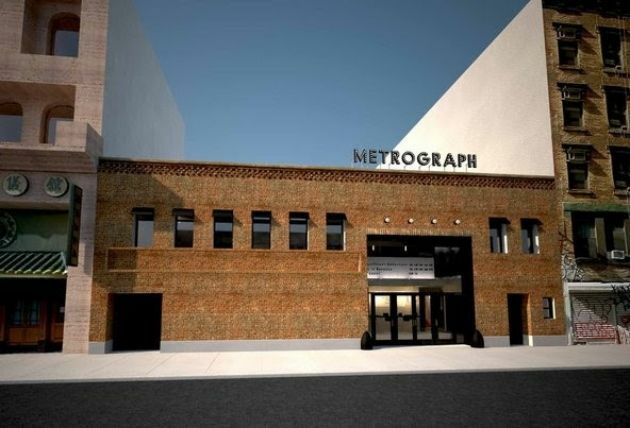 Located at 7 Ludlow Street in the historic Lower East Side, Metrograph showcases first-run and repertory films, and will be devoted to screening archive-quality 35mm prints as well as state-of-the-art digital projection. Theater One, with 175 seats, features a balcony; Theater Two holds 50 seats. Evoking the spirit of old movie studios--Metrograph expands upon the cinema experience to include The Metrograph Commissary--a world class restaurant, two bars, and a cinema-dedicated bookshop. It is both a destination for cinephiles, and a vibrant cultural hub for New Yorkers. One of the essential joys of going to the movies is ritual: the lights dimming, the first beam of light on the screen, the familiar fanfare or logo (the arrow and target to announce "A Production of the Archers"), sitting in the dark with a roomful of strangers, waiting to be transported. Susan Sontag wrote of "the experience of surrender to, of being transported by, what was on the screen." As we open Metrograph, we invite you to experience-or re-experience-films that bestow this singular magic, films that kidnap us into the theater and transport us to the world of filmgoing. In these movies, people watch and we watch them. Titles include: The Long Day Closes (Terence Davies, 1992), Vivre sa vie (Jean-Luc Godard, 1962), Goodbye, Dragon Inn (Tsai Ming-liang, 2003), Taxi Driver (Martin Scorsese, 1976), Matinee (Joe Dante, 1993), Desperately Seeking Susan (Susan Seidelman, 1985), Variety (Bette Gordon, 1983), Demons (Lamberto Bava, 1985), and more. The giants of film history that defined the cinema-changing Nouvelle Vague were undeniable: Godard, Truffaut, Varda, Demy, Chabrol. But the generation of filmmakers who followed them-- children of May '68-- produced movies as provocative and thrilling as anything seen in any film epoch. The brilliant Jean Eustache is a towering figure of this period, making intellectually searching, unpredictable films that uncovered sharp and raw truths about human nature. His most towering work, The Mother and the Whore (1973), is a rightfully beloved epic of generational angst, but his entire oeuvre-narratives, experimental documentaries, essay films, and interviews-collected here for the first time in New York in over a decade, evinces a mastery of the form, an idiosyncratic, naturalistic humor, and an inquisitive artistic nature. Extended engagements of Eustache's two features The Mother and the Whore (1973) and My Little Loves (Mes Petites Amoureuses) (1974), along with Bad Company (Robinson's Place) (1963), Santa Claus Has Blue Eyes (1967), and more rare imported prints. Presented with support from The Cultural Services of the French Embassy and Institut Français. Special thanks to Amélie Garin Davet, Mathieu Fournet, and Françoise Lebrun. "A surprisingly sensitive study of youthful aspirations and conflicting interests among three female friends... It's hard to believe there was a time when such progressive politics could be expressed in a drive-in movie." The sole female filmmaker in a renowned boys' club, Stephanie Rothman made a small, but significant series of subversive exploitation films. One of her greatest films is the ensemble drama The Student Nurses, which forgoes cheap psychologizing and sexual gratuity for a nuanced take on the professional and personal options faced by women. Though she was recognized at the time by some astute critics, it's only recently that Rothman's work has been unequivocally acknowledged for what it is: incisive, funny, and bursting with ideas, and a crucial counter to the overwhelmingly male vision of the American seventies. We're pleased to present The Student Nurses in a new 35mm print from Academy Film Archive, with support from the Women's Film Preservation Fund and Cinema Conservancy. At Metrograph, you will experience all kinds of movies. What will unite them all is-- simply-- that we believe in them, and we think they are films you should see. This is the first installment in a year-long, alphabetically ordered series that offers films we consider must-sees; a pinnacle of a filmmaker's career or an overlooked, demands-reconsideration masterpiece. Call it a very unofficial "Metrograph canon," with one film only per director. A mid-career Scorsese, a left-field Assayas, documentary shorts by must-know filmmaker Madeline Anderson, a classic noir by John Farrow, or Andy Warhol's double-system projected The Chelsea Girls... These are the films we couldn't wait to show, so we had to create a series to justify it. Titles include: The Age of Innocence (Martin Scorsese, 1993), Barry Lyndon (Stanley Kubrick, 1975), The Blood of a Poet (Jean Cocteau, 1932), The Chelsea Girls (Andy Warhol, 1966, image above), The Clock (Vincente Minnelli, 1945), Comrades: Almost A Love Story (Peter Chan, 1996), Deux fois (Jackie Raynal, 1968), The Devil Probably (Robert Bresson, 1977), Dr. Jekyll and Mr Hyde (Rouben Mamoulian, 1931), Equinox Flower (Yasujiro Ozu, 1958), and more. All films on 35mm or 16mm, unless notes otherwise. World-renowned contemporary artist Tom Sachs transformed New York's Park Avenue Armory into a space station, immersing visitors into a large-scale installation titled "Space Program 2.0: Mars." In his first feature film, director Van Neistat gives viewers an intimate glimpse into Sachs's production-- complex and rich with scientific ritual-- following the crew as they embark on a risky mission to the red planet. A Space Program is a vivid work of art on its own terms. Every Sunday starting March 20, we're pleased to present a new preservation or restoration. In some cases, these screenings mark the first times these prints have been shown to the public. Titles include Dorothy Arzner's Craig's Wife (1936), Garson Kanin's My Favorite Wife (1940), Josef von Sternberg's Crime and Punishment (1935), Apichatpong Weerasethakul's Mysterious Object at Noon (2000), Djibril Diop Mambéty's Touki Bouki (1973), and Joyce Chopra's Joyce at 34 (1972) plus shorts from New York's Youth Film Distribution Center. All titles on 35mm or 16mm. Among the greatest and most influential documentary filmmakers who ever lived, Frederick Wiseman is more than just a capturer of reality on screen: he's a conjurer of unforgettable images and a true artist, chronicling the last half century of American life. Still going strong at age 85 (his latest film, In Jackson Heights, was one of the very best of 2015), Wiseman began his career in the late sixties. We're proud to show three of his earliest masterpieces-- Titicut Follies (1967), High School (1968), and Hospital (1970)-- in new 35mm prints. The films were preserved by the Library of Congress National Audio-Visual Conservation Center from original camera negatives in the Zipporah Films Collection. Hugely popular Hong Kong auteur Johnnie To, primarily known for his action movies, surprised and delighted his fans this past year with the remarkable Office, a stylish, buoyant musical shot in 3D featuring grand, eye-popping set design reminiscent of Jacques Tati's classic Playtime. Adapted from her own stage play by Sylvia Chang, who also costars, Office takes place in an austere yet exquisitely realized high-rise, where two new assistants attempt to climb the corporate ladder and please the head honcho (played by the imperious Chang). Office received a limited New York release in 2015, and has been steadily accruing a major cult following ever since. Metrograph is thrilled to bring back this unmissable cinematic treat-- also starring the legendary Chow Yun-Fat-in a special week-long run. "Afternoon is a rare and lovely cinematic expression of gratitude." Taiwanese director Tsai Ming-liang (The River, What Time Is It There? ), one of the most tirelessly brilliant filmmakers in the world, sits down for an extended conversation with his long-time muse Lee Kang-sheng, in a ramshackle rural house to discuss all manner of things professional and very personal. True Tsai fans, prepare to bliss out. Presented with support from Taipei Cultural Center of TECO in New York. "Through it all, Lindon takes in every atom of every situation, every pointer, every negative word, considering what's of value, discarding what's not. This is one of the most sensitively shaded depictions of listening I've ever had the pleasure to watch. He's playing the pressure, but his way: tense, cool." The Measure of a Man. Vincent Lindon is subtly overwhelming as unemployed everyman Thierry, who, after losing his factory job, must submit to a series of humiliating ordeals in his search for work. After numerous dead ends, Skype interviews, ritualized personal critiques by fellow jobseekers, Thierry finds a job, which proves no less soul-sucking. Brizé's drama is powerful and moving depiction of our contemporary economic reality. A Few Hours of Spring (2012), and Bastards (2013). Thirty years ago, South Williamsburg was known as "Los Sures," a place imbued with vibrant life, a community of close-knit Puerto Rican and Dominican families living amidst everyday economic struggle. Today, with the neighborhood fully gentrified, it feels vital to remember this lost world, and Diego Echeverria's essential documentary, shot in the early eighties on 16mm, brings it all back to life, through the eyes of five different residents. Rediscovered in 2007, the film has become a cornerstone program of the Williamsburg arts nonprofit Union Docs, which not only restored the film but in 2015 began the "Living Los Sures" historical memory project, which helps fund filmmakers in continuing to document the neighborhood. For the first time, the brilliant artist David Hockney has given us access to his personal archive of photographs and home movies; the result is an unparalleled visual diary of his life. Randall Wright's new documentary Hockney weaves together a portrait of the multifaceted artist from this intimate, never-before-seen footage and frank interviews with close friends. One of the great surviving icons of the 1960s, Hockney started his career with nearly instant success, but in private he has struggled with his art, relationships, and the tragedy of AIDS, making his optimism and sense of adventure truly uplifting. Hockney is funny, inspiring, bold, and visionary, the definitive exploration of one the most significant artists of his generation. In the new documentary Fassbinder: To Love Without Demands, writer and filmmaker Christian Braad Thomsen delves into the life and work of singular New German cinema bad-boy artist Rainer Werner Fassbinder, starting with incredible footage of Fassbinder winning the grand prize at the 1969 Berlin Film Festival for his debut feature Love Is Colder Than Death- amidst boos and catcalls. Official Selection of the 2015 Berlin Film Festival. As a countdown to our release of this probing, entertaining new film, we present Fassbinder's expectedly idiosyncratic Top 10, as published in 1982, a year before his death. What a lineup: we start with his #1 of all time, Luchino Visconti's decadent The Damned (1969) and then count down the rest- The Naked and the Dead (Raoul Walsh, 1958), Lola Montés (Max Ophuls, 1955), Flamingo Road (Michael Curtiz, 1949), Salò (Pier Paolo Pasolini, 1975), Gentlemen Prefer Blondes (Howard Hawks, 1953), Dishonored (Josef von Sternberg, 1931), The Night of the Hunter (Charles Laughton, 1955), Johnny Guitar (Nicholas Ray, 1954), and The Red Snowball Tree (Vasiliy Shukshin, 1971). Following the recent announcement of the first slate of programs, Metrograph is thrilled to reveal new additions to the March/April calendar. On April 6, Metrograph launches the inaugural event of a new collaboration with the world-renowned Criterion Collection. Titled The Criterion Collection Live!, these events, hosted by Criterion staff members, will feature very special guests, screenings, and audience prizes, and will offer unique insight into the company’s process and the stories behind the films they release in deluxe edition Blu-rays and DVDs. “We’re proud to be joining forces with Metrograph to be kicking off Criterion’s first ever live event," says Criterion president Peter Becker. “This is an exciting opportunity to expand our relationship with our audience in what we think is going to be a really lively and exciting night. We know Metrograph is going to be a vital part of New York film culture, and we’re so pleased to be a part of it as it makes its debut.” Speaking of the partnership, Artistic and Programming Director Jacob Perlin says, “The Criterion Collection is a crucial part of any film lover’s life, and with this program, audiences will have the chance to go deeper, and experience even more of what makes Criterion one-of-a-kind." The first Criterion Collection Live! will focus on the groundbreaking documentaries of Robert Drew and his associates, including the legendary D. A. Pennebaker, who is scheduled appear in person, along with other special guests. A special screening of Charles Lane's landmark film Sidewalk Stories on April 5 marks the start of Metrograph's collaboration with Henry Street Settlement, a nonprofit providing social services and health care, as well as arts programs, to enrich the lives in New York residents. "We are thrilled about our new partnership with Metrograph, which will include film events relevant to our poverty fighting mission and community programs. We appreciate Metrograph's commitment to provide a dynamic cultural space for the Lower East Side," says David Garza, Executive Director of Henry Street Settlement. On March 5, a pairing for the ages: director Noah Baumbach will present George Miller's Babe: Pig in the City and Stanley Kubrick's Eyes Wide Shut, for a one-night-only 35mm double feature on the opening weekend of Metrograph. Baumbach says of these two films, "They feel like dreams I had as a kid, or movies I once pretended to have seen." This screening will mark the start of a reoccurring series. Todd Haynes's masterful Carol will be screened on 35mm on March 26, with Oscar-nominated cinematographer Ed Lachman appearing in person. On March 19, Metrograph "begins its advocacy for the declaration of a new holiday: IB Technicolor Day," says Perlin. Presented in support of this petition, we present Ultimate IB: Three Technicolor Classics: Singin' in the Rain, Vertigo, and Hatari! On April 8-10, with programs including rare 35mm prints of Pedicab Driver (1989), The Man from Hong Kong (1975), Rumble in the Bronx (1995), and more, Metrograph will host The 6th Old School Kung Fest. "Subway Cinema rose from the ashes of the shuttered Chinatown theaters," says its co-founder Goran Topalovic, "so bringing the Old School Kung Fu Fest to Metrograph is one way for us to honor our roots. We are also super-excited to be part of Metrograph's inaugural program, as we share their passion for cinema, and support their vision for reinvigorating the theater-going experience for the audience." *Lebrun will also conduct a lecture on March 12. Tickets will go on sale 2/29, please visit Metrograph website for more info.